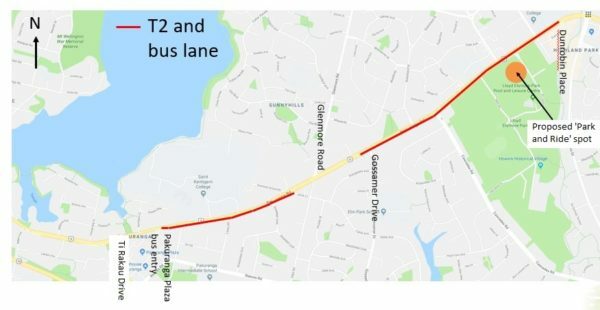 With construction of the AMETI Eastern Busway looming, Auckland Transport (AT) plan to introduce a T2/Bus Lane during peak hour on Pakuranga Road. The temporary westbound T2/Bus Lane is expected to be in place between Highland Park and Ti Rakau Drive through the construction period of two years. It is part of a wider traffic management plan for the construction period which includes a ‘Park and Ride’ service from Lloyd Elsmore Leisure Centre and express bus services to Panmure Station. 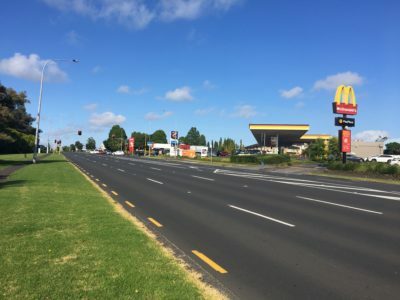 However Pakuranga MP Simeon Brown, Howick Councillors Paul Young and Sharon Stewart and Local Board chairperson David Collings have expressed concerns that reducing the number of lanes along Pakuranga Road would not solve the problem of traffic congestion. Brown says turning a westbound lane on Pakuranga Road into an “interim” T2/Bus lane for the duration of construction should go through a public consultation process. “While a T2/Bus lane will encourage more usage of public transport and ride sharing, which will reduce the number of cars during construction of the AMETI Eastern Busway, Pakuranga Road is one of the busiest roads in the country carrying approximately 50,000 vehicles per day. More thought is required prior to making such a dramatic change to this road,” Brown says. He says transit lanes should ideally be built in addition to existing infrastructure rather than taking lanes away from motorists. “Traffic turning off Pakuranga Road and onto major arterial routes such as Gossamer Drive, Cascades Road, and Ti Rakau Drive will have to compete with traffic driving along Pakuranga Road on the T2/Bus Lane, potentially causing major inconvenience due to competing traffic flows. AT spokesperson Matt Poland says AT has undertaken extensive analysis of various options and onsite traffic monitoring over the last 12 months. “The outcome of this analysis and expert opinion and adoption of international best practice shows that a T2 lane, park and ride and express bus services will offer users of this service and general traffic that does not use the service with better journey times through the construction zone than they would if we didn’t make any changes. He says formal public consultation has not been undertaken because these are “temporary, essential traffic management measures” to minimise congestion during a construction period as opposed to “permanent changes to the road layout”. “We will be delivering local and regional communications activity to advise those who live, work and travel through the area about the temporary changes,” he says. He says traffic management around major construction projects is an ongoing process and AT will be actively monitoring traffic flows and behaviour throughout the construction period and make changes where necessary. More information on how to plan your travel around the AMETI Eastern Busway construction can be found here.